Biography and Paintings of American Tonalist Painter. Considered by several art critics to be the greatest American exponent of landscape painting during the second half of the 19th century, Inness was influenced by both the Barbizon School and the Hudson River School, and is famous for his intimate, lyrical and Impressionist style of art. 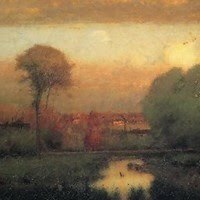 His exquisite handling of light is reminiscent of the work of Frank O'Meara (1853-88), one of the most talented Irish painters of the Grez-sur-Loing artist colony near Barbizon, and helped to define the Tonalist movement. Inness has a particular importance in the history of 19th-century American art: although he was of the same generation as many of the painters of the Hudson River School, his style ran counter to the prevailing taste for the sublime. His slow climb to popularity as a landscape painter parallels the gradual acceptance in the United States of the innovations of the Barbizon School and foreshadows the subsequent overwhelming popularity of French Impressionism among American collectors. Beginning his painting career in New York, Inness moved to the village of Medfield near Boston, and eventually settled in New Jersey. Although self-taught, his sublime canvases convey a mystical almost religious flavour, inspired in part by the theology of Emanuel Swedenborg, according to which everything in nature had a corresponding relationship with something spiritual. Inness remains one of the great modern artists of the 19th century. A biography of him appeared in 1917, written by his son, George Inness, Jr. (1854-1926). The painter who was to reject the spectacular pictorial effects associated with wilderness painters like Thomas Cole (18011848), Frederic Edwin Church (1826-1900) and Albert Bierstadt (1830-1902) was born in the Hudson Valley at Newburgh, but at the age of five moved with his family to Newark, New Jersey. There, at the age of 14 he began drawing lessons. At 15 he became an apprentice with a New York firm of map engravers, and from the age of 16 or 17 began painting from nature. By the time he was 18, he had shown at the National Academy and also the American Art Union, before reportedly receiving some formal instruction from French landscape painter Regis Francois Gignoux, in 1845. During this time he also studied the work of Hudson River School artists Thomas Cole and Asher B. Durand (17961886). Around 1847 Inness opened his own "studio" in New York, in 1849 he married Delia Miller, who died tragically within months. In 1850 he married Elizabeth Abigail Hart, with whom he would father six children. A dry-goods auctioneer, Ogden Haggerty, is said to have interested himself in Inness's early painting, and to have paid for his first trip abroad in 1847, when Inness visited England and Italy. During his time in Rome, it is believed he was introduced to the spiritual theories of Emanuel Swedenborg, by the painter William Page. A second trip to Europe, including a long stay at Florence, followed in 1850-2, after which Inness achieved the status of Associate of the National Academy in 1853. It was around this time that he was commissioned by the Delaware, Lackawanna and Western Railroad to illustrate the history of the company's commercial development. It was, however, his third trip, in 1854, to France, where he first encountered the work of Barbizon plein air painting masters like Corot (1796-1875), Charles Daubigny (1817-78), Theodore Rousseau (1812-67) and Courbet (1819-77), that was the decisive experience for Inness. Now his style really began to change, and in 1859, he went to live near Boston, a city whose artistic circles had been inspired with a genuine enthusiasm for the Barbizon style through the agency of William Morris Hunt. During the 1860s and early 1870s his style of oil painting encompassed panoramic and picturesque landscapes, as well as more quietist paintings, but his exceptional ability in composition, draftsmanship and the atmospheric use of colour marked him out as one of the most talented and successful landscape painters in America. 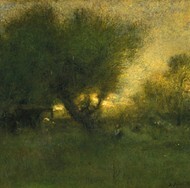 However, it was during the last decade or so of his life, after settling in Montclair, New Jersey that he gave full rein to the soft-focus tonalism - with its intimate expressiveness, delicate handling of light, feathery brushwork, blurred outlines, quiet naturalism, and occasional symbolism - for which he is most famous. His belief in the pantheistic quality of nature led him to find the quiet, the still and the intimate as significant as craggy mountains or sharp cliffs. He began to develop textures and patterns particularly suited to his unpretentious landscapes and came to distrust painting that did not share his feeling for a poetic and intimate realism. Thus he despised the Pre-Raphaelite Brotherhood, but equally disapproved of 1880s Impressionist paintings. The moralizing Pre-Raphaelites he thought insincere and dull on account of their fanatical attention to detail, while Impressionist painters transgressed common sense and quiet good taste by their outrageous colours, which tried to outdo nature. Preferring loose brushwork, he found Luminism too polished. To Inness, nature was the model, and autumn was the season of greatest poetry. When he died in 1894, he was not perceived as a revolutionary, but rather as a faithful transcriber of nature in its calmer and more tranquil aspects. Works by George Inness hang in the best art museums in the United States. Here are some of his best known pictures and the collections in which they are exhibited: Lake Albano (1869, Phillips Collection); Autumn Oaks (1878, Metropolitan Museum of Art, New York); Catskill Mountains (1870, Art Institute of Chicago); October (1886, Los Angeles County Museum of Art); Early Autumn, Montclair (1888, Montclair Art Museum); Sunset in the Woods (1891, Corcoran Gallery of Art); Autumn Gold (c.1890, Wadworth Atheneum, Hartford, Connecticut); Old Farm - Montclair (1893, Nelson-Atkins Museum of Art, Kansas City).  For biographical details of other American artists, see: Famous Painters.  For the development of landscape painting, see: History of Art.  For details of American landscapists, see: Homepage.